Heartbreak Hotel and 1956- Rock Year Zero. When the term “Rock n’ Roll years” comes up, I always wonder just how far back we should go in our search for what would still resemble modern pop music. I would, therefore, suggest 1956 as ‘Year Zero’ for modern popular music and music culture. However, the first thing we need to clear out of the way (or at least I think it might be the first thing we need to do) is clarify that I wasn’t alive in 1956. Yes, I am a young model after all! So, no, I can’t talk about 1956 on a first hand basis. But I do know the mainstream music of 1956 was not yet Rock n’ Roll, but rather big band crooners such as Frank Sinatra, Perry Como or Dean Martin. But ’56 feels a good place to start, so in ’56 I will begin. But why 1956? Well, Elvis Presley had his first true hit for starters. Some of you will be getting opinionated now and want me to know that there was more to early Rock n’ Roll than Elvis. But I know that already, so you can calm yourselves a little bit there. Plus, the style didn’t really start in 1956, but if I’d started in 1955 I’d feel I was more in the ‘Swing’ era which would be fantastic, but Frank Sinatra is something else entirely. This is the “Rock n’ Roll years” I’m considering, or the “Pop years” if you like- and it all started about here. 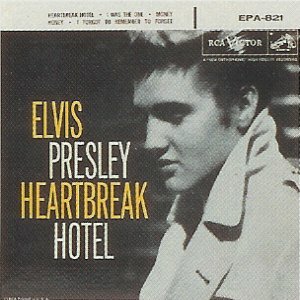 Elvis did do his famous ‘Sun sessions’ in ’55, but I want to start the story with “Heartbreak Hotel”. That song has a lot to answer for I think, far more than Bill Haley’s “Rock Around the Clock”, and far more than any track from the late, great Buddy Holly. Haley’s song is famous, but it’s little more than a good novelty record and Holly was too innocent, too inoffensive. Rock n’ Roll needed real fire to forge its sword. So Presley’s song was something else entirely, written by a schoolteacher from Tennessee, of all people (Mae Boran Axton), with help from singer-songwriter Tommy Durden. It became Presley’s first American No.1 hit single and his first million seller. Some years later, Bob Dylan would sing its praises and you could say Dylan and his contemporaries did that literally; the song arguably offers us the very basic ground on which rock was built. It sounds archaic now, a tinny back alley rendition compared to today’s polished recordings. But that is part of the appeal. This was the first landmark Pop record, yet Pop should always be of the moment, and not a subject of retrospective. So it probably wasn’t meant to be this way. We were probably not meant to listen to and analyse the song 59 years later. But nostalgia plays a part and also the recognition of talent. Speaking of talent, a friend of mine once said that comedy was her music, and that music had never featured in her life that much. I can (just about) understand that, I suppose, but I always thought that she inexplicably missing the power of pop music. It gets everywhere, and can permeate our lives and provide a soundtrack to it. Music can also reach the deepest parts of you. It can make you happy, sad, hopeful, passionate…sometimes it can just make you a bit deaf. There is usually a song for every occasion. Pop Music can inspire and sometimes (sadly) it can create a zealous cult around it that can sometimes be the death of many a talented musician. But for us listeners, Pop Music can make modern life just that bit more exciting. I would argue that our current musical pop culture started with the rise of the post-war consumer culture, and the birth of the ‘teenager’. Where it’s going now, I might yet find out for myself. But it started back in the ‘50s, with the birth of Pop (using the Richard Hamilton Art definition) and the first “Pop” music movement- “Rock n’ Roll”. Both terms (‘Pop’ and ‘Rock n’ Roll’) mean something else these days, but in their raw, early form there was the seed of something special. Because it’s special, and the time was right, it just snowballed into the mad aural media world we know today. Pop music changes lives, that much I know, and some of us are quite glad we were introduced to it and made it our obsession. From Psychedelia to Punk to Metal to Rave to Dubstep….the tree of popular culture blossomed into many branches, but if we go back to those early rock n’ roll recordings, borrowing heavily from the much older Blues tradition, we can locate the modern Pop DNA. Through the evolution of that essence, a lot of us continue to find new places to dwell, down the end of a lonely street…… Heartbreak Hotel. This post marks the 38th anniversary of Elvis Presely’s final live performance of ‘Heartbreak Hotel’, in Baltimore, on May 29th 1977.